Tuesday, October 5, 2010 - ? As we could be famous for, another impromptu and quick trip took us 'home' for a couple of days so that we could attend the Food and Wine Festival, as well as the Mickey's Not So Scarey Halloween Party. We left Binghamton mid-day on Tuesday, driving as far as Chickie's and Pete's in Egg Harbor Township for dinner. From there, we went to the Country Inn and Suites at 100 East White Horse Pike in Galloway, New Jersey (room 225, $72.44 total for the stay), a suburb of Atlantic City. Our flight on Wednesday morning was on Spirit Airlines, and took us direct from Atlantic City to Orlando, with wheels down around 9:00. 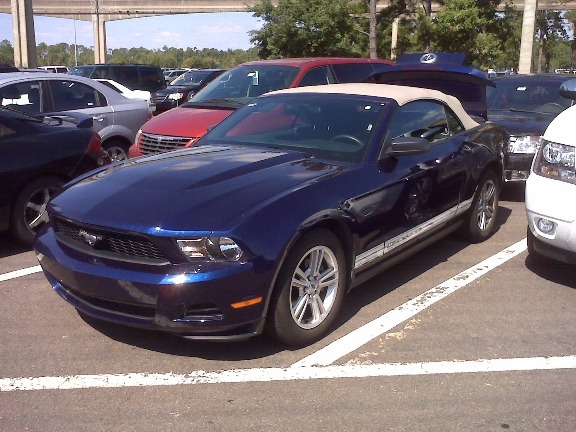 A quick trip to the rental counter, to pick up the sweet ride Jill had arranged for us (a convertable Ford Mustang - yeah!! ), and we were off to property. We checked in first at All-Star Sports so that we could get our park tickets, and then headed to Epcot, arriving there around 10:30 or so. Perfect timing, since we could grab a Soarin' Fast Pass and then head outback where the Food and Wine Festival would just be getting started. For dinner on Wednesday night, we were actually able to secure reservations at Le Cellier! Very good meal there. On Thursday, we grabbed a quick breakfast at the food court at All Star Sports, and then headed back to Epcot, walking around the world a couple more times. On Thursday night, we went to the Mickey's Not So Scarey Halloween Party at the Magic Kingdom, and almost annual event for us! (just like the Food and Wine Festival). On Friday, Jill made us reservations at the Kona' Cafe. Afterwards, we went to Downtown Disney and shopped just a bit, and then headed to Celebration to waste a bit more time before we headed to the airport. Found a good new favorite bar there - the Celebration Town Tavern. Had a few pints there while Jill had a phone meeting. To the airport and back to Atlantic City (flight 288, seat 10E), where we grabbed the car and drove the rest of the way back to Binghamton, arriving home around midnight. 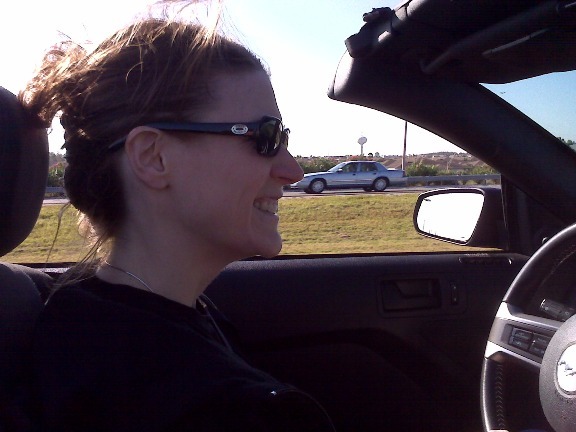 Jill drivin' with the top down! Jill enjoying a Parisien Cosmo Slush! We stayed in room 225. Nightly rate at the Country Inn and Suites was $62.99, for a grand total of $72.44.